How can director Wes Anderson, a man on the verge of self-parody, continue to be one of the defining independent auteurs of modern cinema? It seemed like he reached the apex with the Oscar-winning The Grand Budapest Hotel where his lavish style was met with madcap energy and a subtle attack on his critics. It seems impossible for him to be as charming and artful without at some point stretching too far beyond the stratosphere. Thankfully, Isle of Dogs is not that. Instead, it's a reinvention of narrative, combining Japanese influence with his posh sensibilities. As much issues could lie in a film that features the white voice actors as heroes, Anderson has more on his mind that is interesting, poignant, and innovative in ways that prove he still has a lot to say, even if visually he can't get any more interesting. It's pretty comical unto itself that even the garbage in an Anderson film is artful. The "isle of dogs" is a landscape of waste surrounded by machinery. It's a beautiful dystopia where dogs fend for themselves, forcing the groomed ones to become mangy, covered in dirt and lacking the fortitude to be independent. The central colony of the story are told that they're alphas without ever establishing much of a dominance over dogs fighting over worm-ridden trash. Why have they landed in this predicament? President Kobayashi of Nagasaki outlawed dogs following an epidemic. Is it really for the greater good, or just his affection for cats? It's never clear, though the people fight to have the dogs return. While there's a political subtext to every Anderson film, it does feel like he's found the perfect scapegoats: cute stop motion dogs who have their barks translated to English while the other actors speak in their native languages (mostly Japanese, translated by interns and news anchors). It's a clever way to translate the language barrier, though even that is limited in the grander scope. Anderson is a master of physical communication, causing Atari (Koyu Rankin) to communicate with the dogs through pictures, emphatic language, and body movement. There's no translations necessary to understand the story, and it becomes clear on a deeper level what Anderson is going for. Much like how humans can't understand dogs but know how to sympathize with them, he uses cultural barriers to show that people are alike in spite of not understanding 90% of what's been said. It's also a bold film in that Anderson incorporates Japanese movie influences throughout the film. By itself, the idea of juxtaposing dogs into gags involving samurai gags is clever. To add a Chuck Jones-esque fight cloud over it turns fight scenes into something heightened in a way not seen by Anderson since Fantastic Mr. Fox. This is Anderson at his most primal, managing to tap into canine instincts with a scrappy sense of humor that is less polished than the symmetrical cinematography would suggest. For a director who has a penchant for being formal, it's great to see him act this silly. He brings a personal charm to stop motion that feels both formed and his most carefree film in a long, long time. Isle of Dogs may not be one of his greatest achievements, but even at his worst he tries and succeeds at making something provocative. To watch the characters travel through an isle of garbage is one of the greatest visual aesthetics of 2018 so far. There's not a piece of compacted garbage that is out of place. Even the tall grass sways with a certain organic vibe that no other animated film manages to capture. Anderson is one of the few, outside of LAIKA, who has made stop motion seem like a viable animation style in part because of how delicately the details are arranged, and how the fur manages to sway in ways that no computer graphics could capture. There's an art to everything, and it helps that it has one of Anderson's best voice casts delivering great performances no matter what language. This is a world that could only be made by an auteur trying to push himself and in the process showing how limited American independent cinema can be. It's not just in the animation, but in the way scenes communicate visually. It's proof that audiences can be challenged. 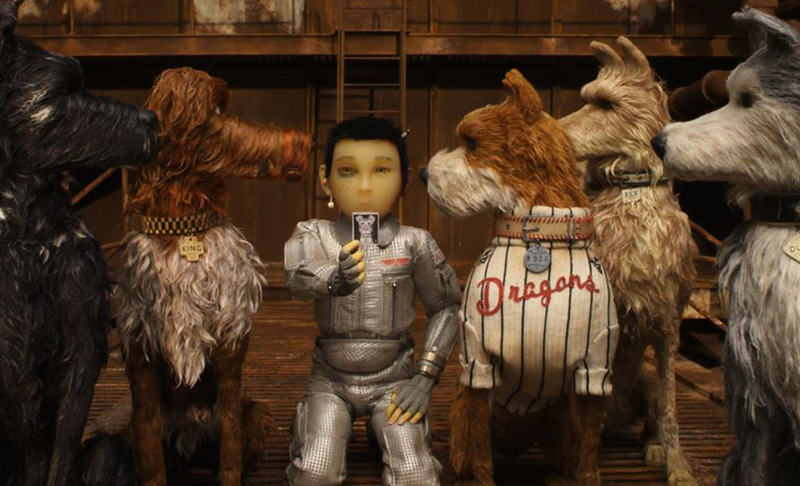 Isle of Dogs is a film that proves the potential of what animation can do. Even if its story is a bit scrappy and comical than Anderson's best, there are plenty of moments where the morbid humor translates with the whimsical fancy of an artist who wants to make world cinema. It's a world where everyone is stuck living among each other, and it's best if they do their best to get along. If they don't, the world will fight in a Chuck Jones-esque fight cloud. It's not always clear what Anderson is going for, but he manages to find the beauty in everything. This isn't a safe movie for dog lovers, but still manages to provoke them to treat them right. It's funny, heartfelt, and largely inventive. Anderson has found a way to push himself without pushing himself off the cliff. That's a miracle, and it's great to see him go even higher as an artist. m4ufree - I find the flickering movie scenes hard to watch. The movie was too slow and strange. It is hard for me to understand the high ratings of this movie and wondering if it is rigged somehow. I almost always give a high review or agree with the going ratings but this one was real bad.